I definitely need to have you come and organize my life! Great read! No matter how many times the weeklies or dailies change, my monthly format is the one static component. My monthlies are sacred ground. Recurring and special events, due dates, and travel dates (in code -those boxes are small) go on there. Overnight stays are noted with a line drawn to the departure date. Details go onto either the weekly or supplemental daily page. Only my handwriting is "real". Anyone else's, is just a suggestion, because only my handwriting is real. Actually, that applies to any part of my planner. "Suggestions" go on sticky notes. My monthly is so boring compared to yours!! I keep birthdays there, as well as the date I need to give my pup his heartworm pill. Everything else is places I have to be at a certain time - which was handy for December, not so much for January or February so far! Lots of helpful tips here. Thanks for putting it together so well. I keep schedules for my family on my monthly. There is definitely no room for workouts, shopping or other chores on the monthly. I color code to save space. Rather than write Billy/Dentist, I write dentist in Billy's color, and it saves a lot of space. I use a dot/symbol system to remember recurring events(I have a multi point frixion pen -- no stickers.) Cancelled items get erased and don't take up space. I can look at the colored circles or squares and know exactly what happened without clogging up my monthly with recurring events. I don't put much on my monthly pages. Just birthdays or anniversaries, and "comings and goings." (We live at a mission hospital, and there is lots of travel going on all the time.) That way I can quickly see the names of those coming & going b/c there aren't other things to distract me. Then during the month, I write down the ladies who work on each day- cook & laundry. Their schedule varies sometimes, so it's too hard to remember. On the side, I'll write potential travel dates ahead of time, and salary advances I give my ladies so I know what to pay them at the end of the month. 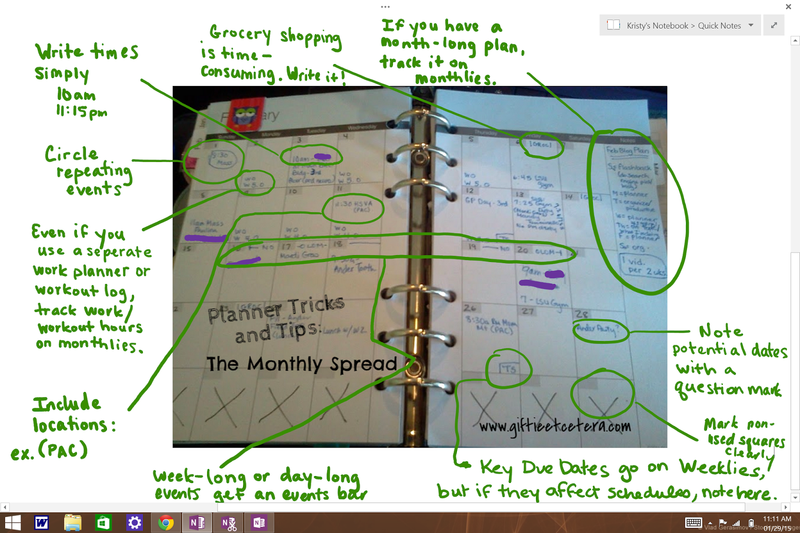 Everything else goes on my weekly pages- meetings, tasks, schedules and other notes.